bayu on Fireflies… Glow bugs… Lightning Bugs… Pick your Preference! Unfortunately, I wasn’t able to identify this tree either. As you can see by the picture, its branches start growing very close to the ground, making it seem like it has multiple trunks. What I found most interesting about this tree are the numerous, thin branches that sprout out of the larger ones. They almost seem like they aren’t part of the tree at all; like they’re vines growing on the tree rather than branches. I found this shrub next to the Soarin Oak. I wasn’t able to identify this plant after searching Google for quite a while. What I do know about it though, is that it had yellow, bilaterally symmetrical flowers, simply divided leaves (no leaflets) that are arranged alternately along the stem, and the leaves are entire, meaning they have no teeth or lobes. I love the shape of the leaves and flowers, though. Hopefully, someone from iNaturalist will be able to identify it for me. These are the bushes bordering the parking lot in front of Moody Hall. They’re very dense with leaves and have numerous tiny white flowers. This kind of shrub seems to grow quite large; it’s growing all along the wall and covers a decent area behind it. It looks like small branches are sprouting out from the top of it too, so we might see it grow even larger if St. Eds doesn’t give it a trim. There I was, walking home unaccompanied (gasp) from the train station in all my college-student-turned-pack-mule glory. I was contemplating the secrets of the universe, wondering about the meaning of life, questioning why didn’t I ever listen to my father and “pack lighter”?? It was a painful trek; the sun was glaring red fury at the world, the sky was cloudless, hot gusts of wind buffeted me on the left and searing exhaust from passing vehicles attacked me from the right. In summary, it was gross. I had regrets. I have a strong suspicion that sweat on my skin was actually the remnants of my brain evaporating from my pores, the heat was so bad. My power was divided between cowering under my umbrella-turned-parasol, and keeping my feet moving along the sidewalk. And that’s when I noticed him. A flutter of black wings, a glint of gold and blue. Six little legs scrambling, trying to hold onto the pavement. The wind was dragging him along the ground without mercy, pulling him toward the blacktop and the cars that roared across it. The Angel of Death clawed at him through the wake of each passing vehicle. I waited until the first break in traffic to scoop him off the curb. He clambered onto my hand willingly, crawled up my arm, then finally latched onto my shoulder. I decided to take him home with me, since he seemed content to stay where he was. Talking to him kept me sane during that last part of my walk home, and in a moment of heat-muddled creativity, I named him Theodore. We had many adventures together this past weekend. He practically lived on my shoulder, which amazed both myself and my family. We had never seen such a still butterfly, although Theo proved to be as clumsy as any human, in his own way: such as when he was startled, or decided flapping his injured wings as he walked across my arm was a good idea. It really wasn’t, but he was cute like that. 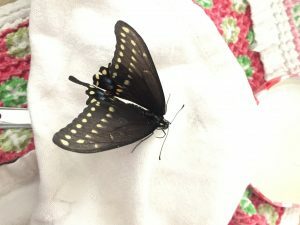 I researched everything I could think of about his species, visited butterfly forums online, searching for information on how to care for him and compiling a mental list of everything I could possibly do to keep him alive. I started keeping a little Theo journal, detailing everything that happened like an overly excited mother who just had her first child. Because when would another opportunity to care for such an amazing little creature come around? 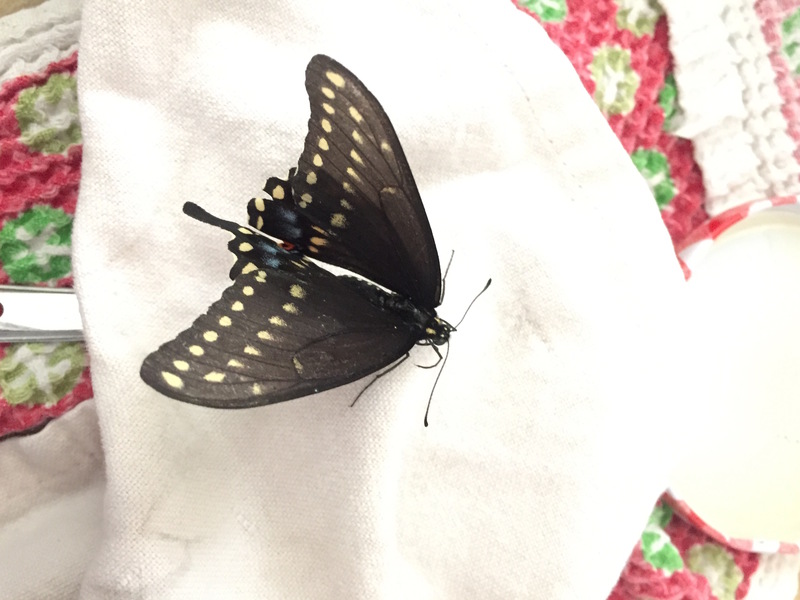 And from what I could see, he was an older butterfly (I called him “my retired little aviator”) and didn’t have much longer to live. I turned out to be right when I woke up on Monday, and my parents told me he had passed during the night. I never thought I would actually get emotional over a butterfly, but there you have it, folks. 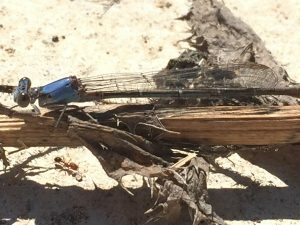 A striking blue exoskeleton, lovely wings, adorable bug eyes. If I could transform into a tiny insect, I’d probably choose to be a Damselfly. The patience of this insect was otherworldly. It was as though Mother Nature had finally taken pity on my failing motivation and sent him to just sit there, while I got all close and personal and took as many pictures as I wanted. And no, he wasn’t dead. I poked him, he flitted about, came right back. Then again, it could have just been a creature from the Netherworld in disguise, doing reconnaissance on the nearby human population. I would have asked, but I don’t normally go around pestering mysterious beings for their personal information. I need good karma as much as anyone. Either way, once I spotted him I dropped to the ground, lying flat on the road as I army-crawled towards him. No worries for my safety: the road was a dead end and the construction workers had left for the day, except for one man who was still loading things into a truck. Thank you, Mr. Construction Man, for bearing with my oddness each time I wander through. Also known as Pearl Bluebush. The scientific name for this cutie is maireana sedifolia. They’re native to Australia, and are very resilient in drought-heavy conditions, kind of like cacti. I believe this shrub and several other plants have recently been planted around the seal in front of Ragsdale. Be sure to pay them a visit and make them feel welcome! Plants have feelings too, I think. I couldn’t ignore the sight of this plant. 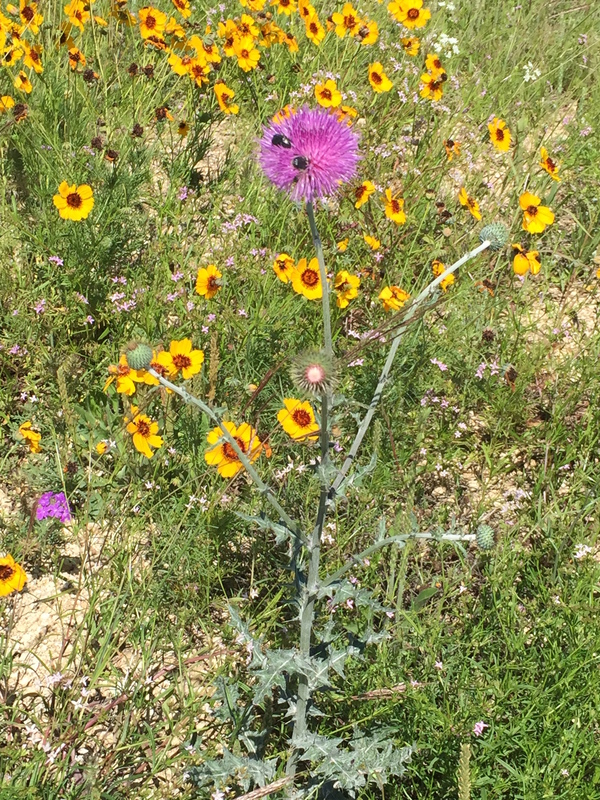 It’s tall, has prickly leaves, and above all… it sports a fuzz flower at the top that’s my favorite color. Quite an eye catcher. Still, I had planned to dismiss it as a potential observation, because look at those leaves. It’s just a weed. Then I thought, well what kind of weed is it? It has to have a name. Let’s find it. Wait for an identification notification and then compare findings. Thistle huh? That’s a word I honestly haven’t heard in years, and it made me smile. It’s fun to say, and the name itself made complete sense to me. Not on some scientific level, though. It made sense to my inner child, who still remembers what each Winnie-the-Pooh character loved to eat. And Eeyore loves thistles. Flashback after flashback of watching that adorable donkey munching on those prickly plants with their fluffy purple offshoots flashed through my mind, and I started to laugh. I am so sorry, Eeyore, for having forgotten your favorite food. Dishonor on me and my cow, and I promise to remember from now on. This might not actually be a Tuberose. I looked around Google for white flowers with yellow centers, and Tuberose seemed to be the closest match. The scientific name for these pretty flowers is polianthes tuberosa, and they’re native to Mexico. I almost missed this one, which is right by the parking lot next to Moody. Luckily, I saw it’s beautiful bright white colors and sleek shape, so I can now share my appreciation of it with all of you. The scientific name for this fluffy friend is sciurus niger. You’ve probably seen these little guys all around St. Edward’s campus and every other place with trees you’ve ever been to; they’re as common as Rattatas. I remember when I first got here, I was surprised at how close the squirrels would get to people. This rascal must be an exception however, a squirrel skeptical of humans. I felt like it didn’t want its picture taken. Too bad, skeptic squirrel. The scientific name for this species is sturnus vulgaris, which I find a bit unfitting, considering how cute these little birds are. Who would call a bird vulgar? This one was running all around the place; it took me at least 5 tries to get a good shot of him. They seem to have a lot of energy. As their name suggests, they’re originally from Europe, specifically the British Isles.